Nazzareno (Rome, Italy) on 27 September 2011 in People & Portrait and Portfolio. Wooowwww !!! Most incredible, like an award winning photo, I feel so sure of. Beautiful and magnifique ! !~ The light of God is surely behind them. Excellent street stuff! Well seen and catched! Fabulous, like a still from a classic movie. Very nice and original contrasted composition ! Well done ! Magnifique image avec un N&B génial. 5*. Bonne journée. Isn't it terrible...no, not the shot-it's really great, the impact that movies have on us. I saw this, and rather than thinking of the Church and religion, I thought of the Dan Brown thriller which talks about the power struggles within the Roman Catholic church. I really like this shot-one of your best! Très amusante cette photo ! NOw, this is a brave and fantastic street shot . Bravo ! A pure classic, bravo ! Excellent beautiful street shot! So many facial expressions! Absolutely wonderful - and they are all soooo handsome! On ne sait où ils vont, mais ils y vont de bon coeur. Celui qui lit le plan a pris un peu de retard. Quel joli coup de filet ! Joli groupe et superbe photo, Nazzaeno ! Ici on ne voit plus de prêtres en soutane, c'est dommage. oh ! so gorgeous ! Félicitations pour le Spotlight, trop géniale ton image. Bonne soirée. This is a truly remarkable photograph on so many levels . . your capture of the moment and presentation are first class. So leased to see this in the Spotlight. Well done. Congratulation on your spotlight image!! so well deserved!! absolutely magnificent image - the light, teh tones, the scene - absolutely a winner!!! Congratulations. This a fabulous photograph; so well deserving of the Spotlight (and one of your very best). Congrats on the spotlight ! Very nice composition and b&w ! A very unique image with some great faces, congratulations for the Spotlight recognition! Well done!!! Perhaps a future Pope in this shot? Fabulous street shot! The black and white really accentuates their robes. Interesting expressions and great processing. Excellente photo autant sur le plan esthétique que technique et la pointe d'humour, c'est la cerise sur le gâteau!!! BRAVISSIMO!!! Excellent! The expression on the one man's face is priceless. 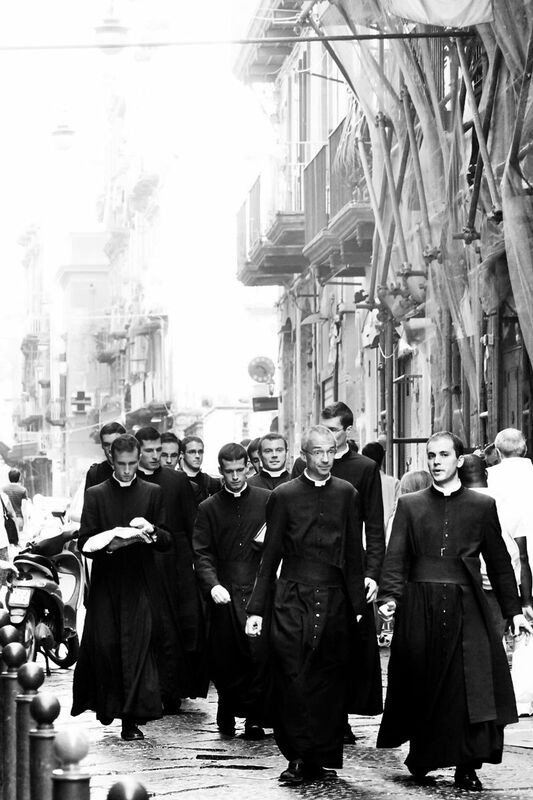 I like how the men, in their dark clothes, stand out from their surroundings. love it! Well captured expressions. amazing photos I have seen this entire year !! i love this image! great shot! Naturellement Noir et Blanc ! Génial.